All in all, Hannah Johnson is pretty happy as a missionary kid. In Papua New Guinea, no one worries about fancy clothes or credit card limits--everyone has other things to think about. But when Hannah visits her cousin Vanessa for a summer in America, everything changes. Vanessa and her friends try to catch Hannah up on all the latest fashion trends, but in the end, Hannah feels hopeless. She doesn't think she'll ever be able to keep up with the rich girls--but that doesn't stop her from trying. In the process, Hannah is forced to come to grips with what she values most: beauty on the inside, or beauty on the outside. This is a topic that almost any high school girl can totally relate to. Clothes are almost the biggest factor of what makes you part of the in crowd and what leave you on the outskirts. These days especially, labels are the ticket to popularity. Having lots of money almost guarantees being in the in crowd. Why are we so fascinated with having lots of money? Melody Carlson perfectly translates the feelings of a teen girl struggling with not having the money to buy everything and having to face those who do. I was a bit worried at first that Hannah would be a total goody two shoe because of her background. She is a bit naive about somethings because she hasn't been in the country that long and isn't up to the pop culture. However she acts pretty normal which is good because it's more relatable to reader. I kept getting really annoyed with Vanessa throughout the book. The same with her mother as well. I cannot stand being around those type of people and it just made me want to scream throughout the entire book. I can accept this type of behavior if you earned the money you were spending. However, teens who spend credit cards using their parents money "just cause" really annoys me. I wish all parents realized that giving your kids everything they want does not make them love you more or make you a better parent. That being said, I rather enjoyed the ending and what happened to Vanessa and her mom. Almost like justice was finally served. Something I found a bit weird and annoying after awhile was the continued calling of Ross Dress for Less. Let me say, I love the store. I get stuff there all the time. They have great deals and a really good selection. I just have never heard anyone keep calling it by it's full name. I could understand the first time it was mentioned but repeatedly calling it that way? At that point, it seemed like an ad for them, and that Ross Dress for Less had paid for product placement. Other than this, I really enjoyed this book. The subject matter is one that many teen girls will be able to relate to and even women in their 20s and 30s can get advice out of this book. Sadly we live in a material world and when you don't share that lifestyle it can be incredibly hard. Again another great YA book from Melody Carlson. Finished My Final Book of 2009! 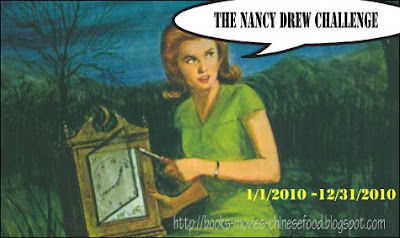 Nancy Drew Challenge Update: Prizes! I'm Gonna Be on the Radio!! !